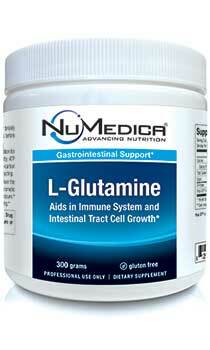 NuMedica L-Glutamine Powder provides powerful support for multiple systems of your body. Glutamine is one of the most common amino acids in the body and provides support for the digestive system, immune system, liver function, and even improved brain function. NuMedica's natural supplements are renowned for their safety and effectiveness. As a leader of the nutritional supplement industry, NuMedica continues to develop natural products that support optimum health. Glutamine and L-Glutamine: What's the Difference? Unless you're a chemist, you generally wouldn't concern yourself with the difference between glutamine and L-glutamine. The difference has to do with how they bond to other amino acids in the body. L-glutamine could be said to act like a left hand and glutamine like a right hand. When you see either glutamine, you are talking about the same thing, nutritionally speaking. Glutamine is an important amino acid that various parts of the body need to support optimum health. Glutamine can be found in the body in areas like the brain, digestive tract, and muscle tissue. By taking NuMedica L-Glutamine, you can support these areas of your body. Some people find that their metabolism improves after taking L-glutamine. Others find that it reduces cravings for substances like sugar and alcohol. Our stomach lining is continually impacted by our diet, preservatives in processed foods, medications, and chemical additives found in products today. For this reason, it's not surprising that many people suffer from digestive complaints that range from mild to severe. 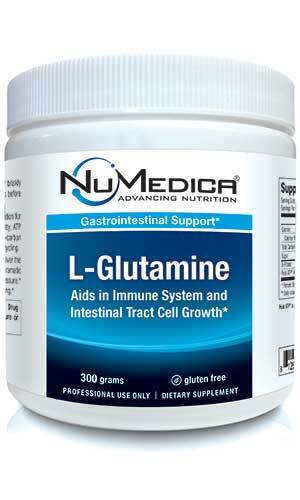 NuMedica L-Glutamine can enhance the stomach lining and enhance the absorption of nutrients. Glutamine also supports improved hydration because it enhances water absorption. By supporting the liver, pancreas, and esophagus, this nutritional supplement can enhance multiple functions of your body. Directions: Mix 1 teaspoon (5 grams) with juice and take in the A.M. on an empty stomach or as directed by your healthcare practitioner.